Fondant takes to long to dry, gum paste is virtually inedible and buttercream just isn’t suitable for some applications. Choosing the right medium for your cake project is sometimes the trickiest part. When is fondant appropriate, when should I use gum paste. And now I am going to tell you that there is something else you can make (very easily I might add… ) and use for so many different applications. This simple 2 ingredient medium is not only extremely versatile it is also delicious. 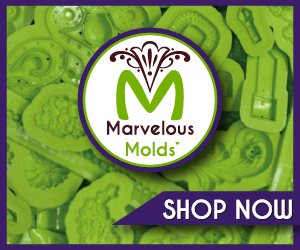 It can be used to cover cakes, make flowers, sculpt, mold… really just about anything. The process is simple, but comes with a few precautions and in the video below I will walk you through some of those. You may have also heard Candy Clay referred to as Modeling Chocolate, although not completely interchangeable, these 2 products are the same. What differentiates the two are the ingredients used. – Modelling Chocolate uses real chocolate. The quantity of ingredients used will depend on the type of chocolate you choose to start with and if you check out Kara’s Couture Cakes‘ blog post she will go into all the nerdy details (she knows I mean that in the most loving way, she’s a self proclaimed food science nerd). Once you master the art of making candy clay you will find yourself highly addicted to its smooth texture, and its ability to hold its shape almost instantly. The way you can sculpt and blend it, it’s amazing sweet, chewy (not too chewy though) texture… Man you will NOT be disappointed. Candy clay will dry firm but remain soft in the center so that when eaten has this almost truffle like consistency and allows your clients to eat ALL of your decor without the usual precautions that go along with gum paste or even big hunks of fondant. In this video I use Kara’s Couture Cakes’ Candy clay recipe. The video is full of answers to questions asked during the broadcast. However if something wasn’t covered or you have a question PLEASE comment below or on the Facebook post and I will be sure to follow up. These are Kara’s recipes, shared with her permission despite (lovingly) calling her a nerd. This simple 2 ingredient medium is not only extremely versatile it is also delicious. It can be used to cover cakes, make flowers, sculpt, mold... really just about anything. What could it be? Melt chocolate/candy melts in the microwave in 30 second intervals until nearly completely melted, stirring between each turn. Once there are only a few lumps left, allow to rest in the microwave for 5 minutes to allow the heat to penetrate and melt them. Be careful to not burn the chocolate/candy melts. Pull a spatula along the side of your bowl to be sure there are no small lumps remaining. These will create a grainy final product. Change your bowl - scrape all melted chocolate/candy melts into a fresh bowl. Warm corn syrup in the microwave until just barely warm. Add the warmed corn syrup to the melted chocolate/candy melts and gently, slowly pull the corn syrup through the mixture. Be sure to scrape all chocolate/candy melts from the bottom and allow the corn syrup to make contact with all of it. This shouldn't take more than about 30 strokes of the spatula, and it's important to stop as soon as the mixture looks like softserve ice cream or ricotta cheese. Once you’ve finished mixing, pour your mixture out onto a piece of plastic wrap, flatten in with your spatula a bit, and wrap it air tight. Leave it to sit on your work surface to cool and begin to firm up a bit. If you lay your plastic out over a baking sheet and wrap it there, you’ll be able to move it from your work surface with ease. Candy clay sets a bit quicker than modeling chocolate. Once cool and set, but not firm, unwrap and work the modeling chocolate/candy clay through your fingers to smoosh any tiny lumps that may have formed. Then gently knead all together. Use it now, or wrap it airtight in plastic and store it in a large zipper bag or airtight container. You can freeze this if you want to keep it longer than a few weeks. Now go, get your chocolate, your corn syrup and experiment!